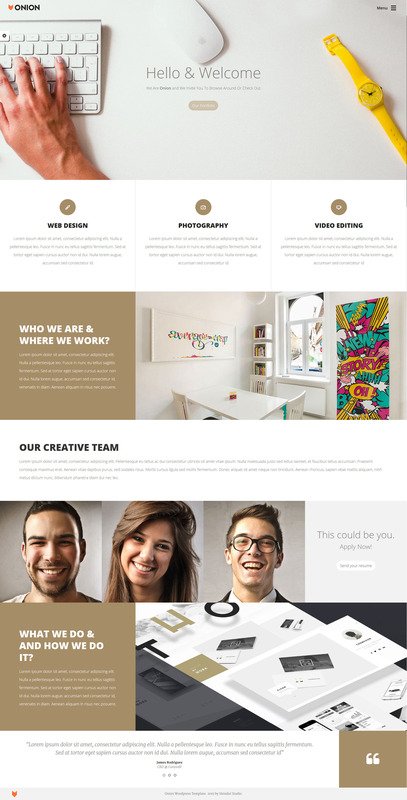 Onion wordpress template is a high-quality portfolio theme designed for agencies, studios or freelancers. The template allows you to publish your work online with ease and to look amazing doing it. Packed with complete solutions for about us, contact, portfolio, blog or single post pages, Onion wordpress theme is a number one choice if you are a studio, agency or a freelancer. You can choose your home page from several templates or it can be a portfolio of your items in 3 different ways. Onion responsive wordpress theme uses Visual Composer to create pages. Portfolio and blog pages are created in just a couple of clicks from the backend. It is a pleasure to use and it provides excellent results. Showcase your work and show its full potential with 4 prepared single portfolio layouts and clean and modern work page. Full-screen layouts will work wonders for your projects and will make your portfolio stand out from the crowd. Perfect for displaying various digital work ranging from web portfolio and logo portfolio to full graphic portfolio and architecture. Cleand and modern blog section allows you to run a successful blog on your website with the single blog post focused on readability with drop down comment section. Onion portfolio theme is perfect for displaying your printed material. 2 out of 4 single portfolio item layouts are created especially for displaying pre-press and print work. Clear and easy to browse through, work page allows you to add as many single projects as you want. With the option to add as much images as you want in the single project page, you can unleash a full potential of your stationary design and present it to your visitors in the best possible way. Responsive design of layout pages will make your content visible on all screens ranging from mobile phones to tablet displays. Grid oriented work page lets you arrange your industrial design projects in an orderly fashion. With the vertical scroll on the home page where you can put a spotlight on your main work, Onion is the template for you if you want the best out of portfolio theme. - Fixed demo install for Revolution slider. 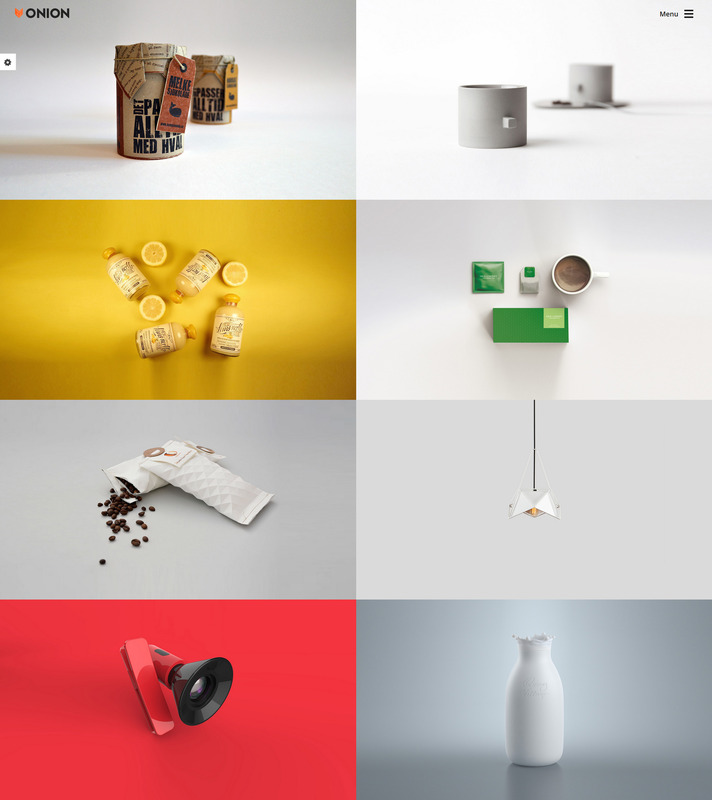 Onion WordPress Portfolio Theme is one the best portfolio themes on the market. It’s a creative portfolio theme, primarly made for our own purposes and, after we saw positive feedback, we decided to turn it into responsive portfolio theme. If you are a web design agency, you can use Onion wp portfolio theme to create your own portfolio website, or to create one for your client. If you’re a freelancer, you can get more clients by showing them your previous work by creating a responsive portfolio website with this website portfolio wp theme. 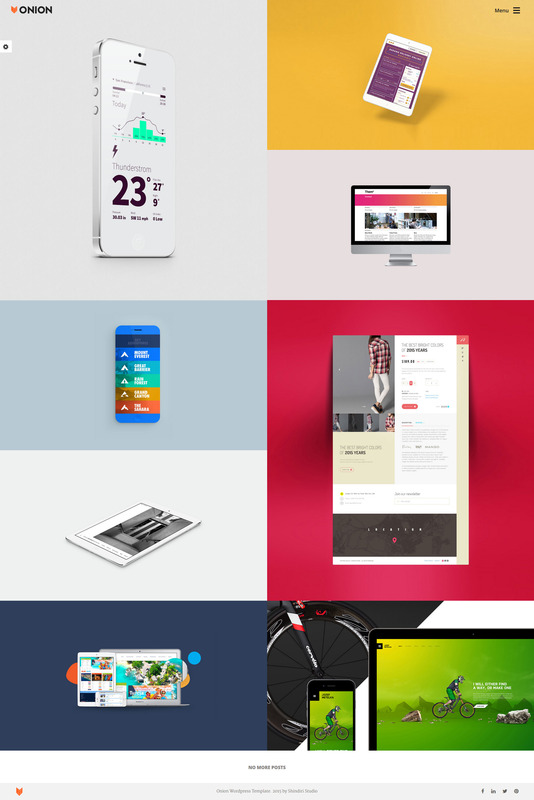 No matter what type of business you have, you can use this responsive website portfolio template to create your portfolio website and showcase your work, your products, your services and your business. 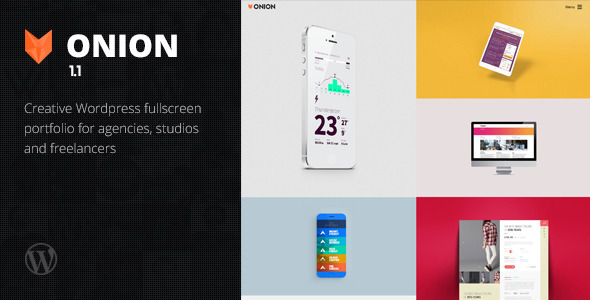 Try Onion Responsive WordPress Portfolio Theme today.